Dodson was another AFL2 veteran who made the jump to the AFL with the Austin Wranglers in 2004. 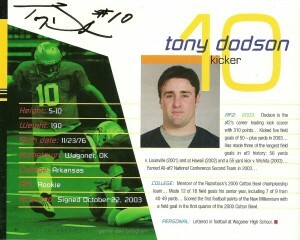 Dodson would play one season with the Wranglers hitting 84 of 97 extra points and 8 of 18 field goals. He’d jump to the Nashville Katz in 2005 making 7 of 23 field goals including a long of 56 before retiring after the season.